Every so often, I like to take a day off and unwind from the crazy journey we know as life. When I do, that’s typically when I see a sign that the passion I have for helping women learn to love their bodies and feed it right is what I need to be doing. Yesterday, I was lounging around my apartment because we were having our umpteenth snow fall of the season and I tuned into Bethenny. One of her guests for the day was an AMAZING woman named Torrie who lost 148 pounds in 3 years. Torrie is amazing because she did it the right way: she healthified her favorite foods so she’d never have to deprive herself of anything. 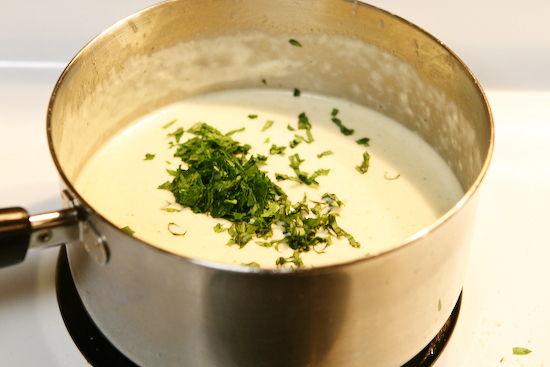 I found this recipe a while back and it’s an incredible way I can keep one of my “guilty pleasure” – Alfredo sauce – in my culinary repertoire. Another great thing about this recipe is that it uses Greek yogurt so I get a nice dose of protein and keep my immune system in tip top shape! Pour over your favorite bowl of pasta and enjoy! Want a Healthy and Robust Immune System? Eat Greek Yogurt! The past few weeks money has been a little tight and I’ve been eating crappy boxed and processed foods because that’s what I could afford. I will NEVER make that foolhardy choice again! The first week I bought the boxed/processed foods, I was pretty dismissive because I had finally changed over to a lifestyle where I no longer WANTED to eat things like Kraft Macaroni & Cheese or Oscar Meyer bacon; I preferred Greek yogurt with berries and granola. Boy, did I ever get hit with a metaphorical 2×4!! As one week turned into two weeks and then one month, two months, I got a nice little reminder of why I banished those crappy “foods” from my kitchen. At the beginning of the month, maybe around the 5th or 6th, I started sniffling a little bit and before I knew what hit me, I had my first head cold in two YEARS!!! Earlier this week, I was able to afford better food and I made sure to buy a huge tub of Greek yogurt because I while I was sick, I found an article that indicated approximately 70% of our immune system is in our digestive tract! As the old saying goes, “the proof is in the pudding!” and the only word that can describe Greek yogurt is “miracle cure.” That may sound a bit melodramatic, but it’s a perfect fit nonetheless. When my cold was at its worst, I couldn’t keep my head clear for more than 2 or 3 hours (I think I went through two boxes of tissue in one day!). Sleeping was next to impossible – I was lucky to get three straight hours at any given time. After I bought my tub of Greek yogurt, I splurged and ate about 1½ cups and it took about four hours for my body to start repairing itself. About four days later, it was as if I’d never been sick!